Trinity’s transitional kindergarten and kindergarten programs provide a wonderful foundation for our youngest learners. In both TK and K, class sizes are small. With just 12 students for each of our homerooms, each class is able to offer a rich, age-appropriate curriculum. In addition to the homeroom teacher, each class has a dedicated full-time assistant. Students in TK and K have the opportunity to benefit from our Singapore Math curriculum; a strong language arts curriculum; weekly classes in music, art, and PE; field trips and special celebrations; and extensive outdoor play. Read some of the most frequently asked questions about Trinity Transitional Kindergarten and Kindergarten below. Why are TK and kindergarten partial-day programs? What does developmentally appropriate mean? Why are the emotional and social developmental stages important? What is Charlotte Mason's educational philosophy? Will children learn how to read in TK and kindergarten? Will children learn handwriting in TK and kindergarten? How are our kindergarten children prepared for first grade? Transitional Kindergarten (TK) is designed for younger five-year-olds (TK students must be 5 years old by December 31). For some children, TK might be their first school experience, while for others this might be a transition from a daycare or preschool setting to a classroom in an elementary school. For some students, TK best matches their developmental age and stage and is a perfect place to begin. In transitional kindergarten, we teach oral language, literature, pre-reading, and number-sense skills through hands-on and play-based activities and experiences. The children have ample opportunities for making choices, listening, sharing, and cooperating as they become more self-aware and self-regulating of their own words and actions. A TK student’s attention span is short, so group lessons are brief initially and lengthen bit-by-bit throughout the year. We create a classroom atmosphere in which our youngest children have space and time to grow and thrive as they delight in learning. 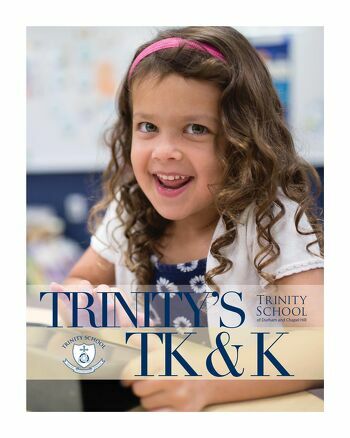 Trinity has partial-day programs for our TK and kindergarten students for several reasons. First, research (by both the National Association for Early Childhood Education and Charlotte Mason) shows that the optimal time for learning is in the morning. Second, free afternoons allow children to have some down time and then more time for playing and exploring—just being a kid—whether at home with a parent or attending our optional Trinity Neighborhood after-school program. Trinity Neighborhood offers home-like activities and outside play for those families whose children are ready for a longer day, or for families whose schedules require a later pick-up. A partial-day program allows children to be in school when they are fresh but still have time for rest and play in the afternoons. (Remember, learning includes physical play, imaginative play, and cooperative play, and play helps develop physical, motor, and language skills for reading, writing, and math.) Trinity believes in making many small steps over a long arc of time. So from TK to kindergarten to first grade, students transition and grow gradually into a full day of learning. Whether your child comes home at 1 p.m. or later in the day, we believe he or she will be leaving school brimming with ideas, happy (not stressed), and looking forward to another great day at Trinity. Children go through similar and predictable sequences but at their own rate or pace. Factors such as genetics, personality, and temperament may influence the social, emotional, physical, spiritual, and intellectual aspects of development for each child. These aspects seldom develop at the same rate. The stages are predictable, but they can’t be sped up or skipped over. Each child’s learning journey is uniquely his or hers, especially during these early years. School years come in neat, one-year increments, but children’s development does not. As educators of young children, we are keenly aware of how young children learn, and we have designed the day and the curriculum to be developmentally sensitive to and appropriate for the ages and stages of our youngest children. The developmental age and stage of each child is just as important as his or her chronological age and stage, especially for our children being placed in transitional kindergarten, kindergarten, and first grade. It is essential that young children’s emotional and social development receive the same attention as their cognitive development. Emotional skills and abilities at this age include understanding the emotions of self and others, knowing how to react appropriately to others’ emotions, and being able to self-regulate one’s own emotions. Social skills and abilities equip children to be effective in their interactions with others. These skill sets include: recognizing social cues; interacting positively with peers and adults through cooperation, listening, and taking turns; and initiating and maintaining conversations. The emotional and social development of young children may occur at a rate different from the development of their cognitive domain (thinking). For example, some young children may be able to count and read, but may become easily frustrated when they are playing cooperative games and may interrupt, become bossy, whine, cry, or withdraw. Research indicates that when emotional and social development stages are acknowledged and supported, the “executive functions” in the brain (problem-solving/decision-making) develop as well. Providing time and ample opportunities for all kinds of play, conversations, and language experiences for our young children allows the emotional and social domains to mature. “The single best childhood predictor of adult adaptation is not IQ, not school grades, and not classroom behaviour but rather the adequacy with which the child gets along with other children ...’ Hartup, W. (1992). they are surrounded with beauty, laughter, and many books. Trinity School uses much of Charlotte Mason’s philosophy of education for shepherding and teaching our children and for designing our curriculum. Most kindergartners finish the year reading beginning primers, and some go beyond. In TK and kindergarten, teachers begin teaching reading by choosing and reading aloud wonderful stories and literature—what Charlotte Mason called “living books.” The love of books fuels learning how to read and supports learning far beyond that initial skill acquisition. Generally speaking, TK begins with teaching print awareness, letter recognition, rhyming, letter/sound association, and some sight words. Kindergarten usually begins with letter/sound association, phonemic awareness, blending, phonics, and sight words. Teachers always begin with what the child knows upon entering. Phonemic awareness is an important focus for our kindergartners, even for those who enter as readers. It is foundational not only for reading but for spelling, as well. Teachers work 1:1 or 1:2 with the children. All children have the chance to listen to books being read aloud to them and books on tape at various times during the day, every day. Handwriting is the most complex, demanding skill a child learns. It uses physical, tactile, motor, and neurological processes. These functions are not all fully developed and integrated until about age ten, and this process of integration underpins other skills such as reading and spelling as well as strengthening memory. Important prerequisite skills for handwriting are the development of body coordination and balance (gross motor skills) and hand strength and dexterity (fine motor skills). Bouncing balls, climbing, hanging with both hands from a crossbar or tree, skipping, cutting paper with scissors, making pinch pots, and similar activities take place before a child even picks up a pencil. At Trinity, children have an abundance of activities that allow for gross and fine motor development. By the end of kindergarten, most children are familiar with the tripod pencil grip; can copy some shapes, letters, and numbers; write their name and some words; and may free write as they wish.